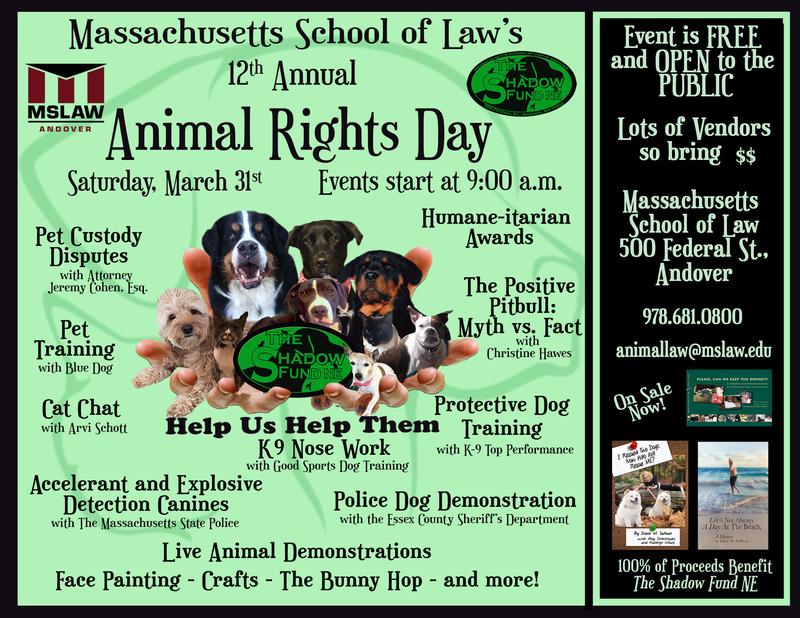 ANDOVER, MA – A full morning of sessions discussing the legal issues surrounding animals will highlight the Massachusetts School of Law’s (MSLAW) Eleventh Annual Animal Rights Day on Saturday, March 31, 2018, starting at 9:00 a.m. The event is free and open to the public. Dean Michael L. Coyne will open the event with welcoming remarks. Legal issues will be addressed by MSLAW Professor Thomas Martin, along with presentations by BlueDog and K-9 Top Performance. A police dog demonstration will be presented by the Massachusetts State Police. Kids’ activities will also be available, including Story Time, face painting, and animal crafts. Copies of the book, Please, Can We Keep the Donkey?, written by MSLAW Professors Diane Sullivan and Holly Vietzke, will be on sale at the event. All proceeds from book sales will benefit the Shadow Fund, established by MSLAW to assist pet owners who have companion animals with medical needs. The fund was the outgrowth of donations collected by the school to help a local Vietnam Veteran named Robert Burke whose dog, Shadow, required surgery which Burke was unable to afford. The event will take place at MSLAW, located at 500 Federal Street, Andover, MA. For more information call MSLAW at (978) 681-0800. I Rescued Two Dogs: Now Who Will Rescue Me?